Indulge!!! At less than 2 points per brownie, why not? :) The perfect, chocolatey dessert that will completely satisfy your sweet tooth! Preheat oven to 350. Spray mini muffin pans with Pam baking spray. In a medium bowl, combine brownie mix, egg, water, and applesauce. 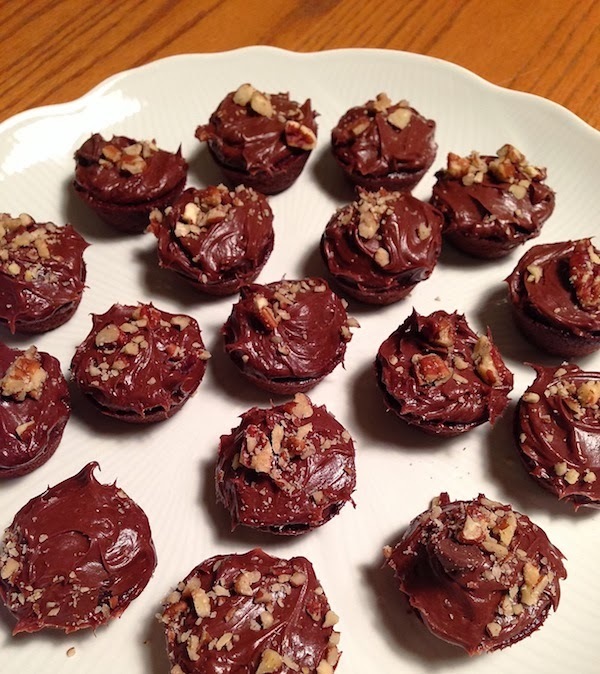 Spoon brownie mix into muffin pans, "Kfilling 3/4 full. Bake for 10 minutes or until a toothpick comes out clean when inserted into the middle. Let cool and spread 1 teaspoon of frosting on each brownie. Sprinkle brownies with a little bit of pecans (optional). Enjoy! If you'd like a printer-friendly copy of this recipe, Click Here.